Pink and white nail polish with nail file and french manicure "nail guides". 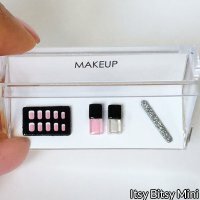 Manicure set is packaged in plastic presentation box. Items can removed and displayed on desk, tray, etc. Nail polish bottles are 1/8 X 1/4 in (3 X 6 mm) made of glass. Nail file is 1/32 X 1/2 in (2 X 13 mm) made of metallic paper. French nail guides are 1/4 X 1/2 in (8 X 13 mm). One inch Scale 1:12.